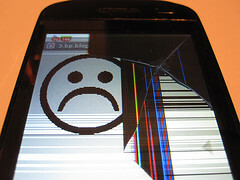 Can I Replace My Smartphone Screen Myself? Yes. Should I? Maybe. Can you replace a cracked smartphone screen yourself? Yes, and there are plenty of tools, kits, and online tutorials available to help you. Should you do it? Maybe, say our colleagues down the hall at Consumer Reports, armed with pentalobe screwdrivers and lab coats. The process takes a long time, is challenging, and you might end up with defective parts… or break the new parts or you phone when you make an error.